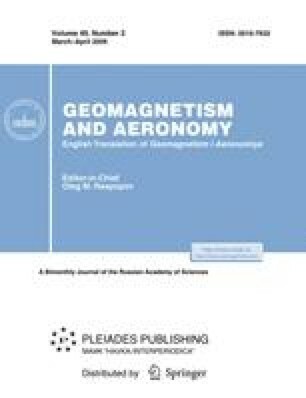 A retrospective analysis of the Russian magnetic observations of the Carrington event that occurred on September 2–3, 1859, has been performed. The conclusion has been made that this event was caused by the series of three recurrent eruptive solar flares during ∼40 h. The characteristics of the geomagnetic crochet, related to a considerable flux of the ionizing electromagnetic radiation during this flare, have been studied. The value and direction of a magnetic field disturbance, registered during the maximum of the geomagnetic storm of September 2, unambiguously indicate that all Russian stations were in the auroral oval zone, which was strongly expanded southward from its average position. The disturbance dependence on the station longitude—the absence of magnetometer pinning in Nerchinsk—is interpreted as the possible manifestation of a strong asymmetry in the effective contour of the current system, which was connected to the heliosphere and covered the disturbed magnetosphere and ionosphere during the short period that lasted only 1–3 h.
Original Russian Text © M.I. Tyasto, N.G. Ptitsyna, I. S. Veselovsky, O.S. Yakovchouk, 2009, published in Geomagnetizm i Aeronomiya, 2009, Vol. 49, No. 2, pp. 163–173.